Networking involves linking people with people, people with information and people with opportunities. But we need to be open to recognising and optimising opportunities in order to be effective in helping others. Let me tell you a story to demonstrate this. Years ago, I joined the National Speakers Association of Australia, Sydney chapter. I love meeting interesting people and holding quality conversations. On each visit to Australia I attended a meeting or conference and as a professional speaker, learnt a great deal from programmes and the amazing people I met. Amongst them were Rob Salisbury and Monika Newman. As in any networking it is important to build relationships and sustain them. We kept in touch and I was delighted when they invited me to contribute an article to one of their annual composite motivational books. Since then I have contributed most years and am delighted that the latest book was launched in February 2019. I am pleased to offer you a complimentary copy of Motivating your Mind – Inspiring your Spirit which you can view by clicking here. To view my article, click on my front cover photo that will link directly to my story. My article, Use your Low-energy Times Productively can be found on pages 51 and 52. Congratulations and thanks to Rob and Monika on this outstanding achievement. What are you doing to share your knowledge with others? How can you share opportunities with people in your network? To meet exciting people what can you do, where can you go? How can you share this motivational book with as many people as possible? In which ways can you tell Rob and Monika how you appreciate their efforts? If you enjoyed an article in this book, how soon can you send a positive comment to the author of that story? People continue to enrich my life. Recently I was interviewed by the amazing Michelle Pascoe of Optimum Operating Procedures and Services (OOPS!) who works mainly in the casino, gaming and hospitality industries in Australia and elsewhere. Michelle and I became friends a number of years ago through our mutual membership of the Sydney Chapter of the National Speakers Association of Australia (NSAA) which later became Professional Speakers Australia (PSA). Over the years we have shared many wonderful conversations as our fields of interest and work are intertwined. My recent interview formed part of Michelle’s Middle Management Movement (M3) series and can be accessed here. She describes the topic as my “tips on how to find and choose the right coach to inspire you to achieve your full potential and sustain your well-being”. The title of the interview was “Choosing the Right Executive Coach” an area of great interest to me. When a good interviewer, like Michelle, sets the scene and asks you the right questions, you discover that you can add value. So please listen to the recording and let me know your thoughts. Thank you! The building of relationships is an ongoing process. What are you doing to move away from a transactional approach (meeting a person for the first time and holding a conversation) to following up and building the relationship so that you can help each other? Nurture your friendships, hold quality conversations, explore common ground and you will be able to recognise and optimise opportunities for each other. What are you doing to network with like-minded people? How are you improving the quality of your conversations? How can you include someone else in a combined effort? For more information on leadership development, improving your networking or Executive Coaching please contact Brenda on +27 82 4993311 or brenda@strategy-leadership.com Thank you! Through positive relationships others can spontaneously assist you in achieving goals you may not have dreamt of. You need to focus on your personal strategy yet be open to using peripheral vision to notice opportunities arising. Here is an example of how a person helped me to progress. The context involves a webinar, ‘How to be a more productive coach’ which I’ll be presenting on September 20th 2018, from my base in South Africa. This will be for the International Coach Federation (ICF), Australasia Chapter. How did this opportunity materialise? Tracing the ‘golden thread’ to what made this possible was an interesting exercise. We could go back further to building positive relationships through coaching, but let’s start in 2012, the year when I asked Janine Everson, Director of the Centre for Coaching, University of Cape Town’s Graduate School of Business (GSB) if she could recommend coaches whom I could connect with on my next visit to Sydney. Joe Fischer and I met and immediately recognised common bonds and co-incidences through work and family. On my following trip we met for coffee again and he mentioned that Janine would be running a 6-month coaching course (training coaches) in Sydney. As I was currently mentoring emerging coaches for the GSB in Cape Town, I offered and became the pod-mentor for Joe and his group of 6 other participants engaged in the ACC course. I really enjoyed my interaction with that group and we continue meeting during each of my trips to Sydney. Melanie Gowlland, Joe Fischer, Brenda Eckstein, Sophia Bernard, Kirsty Grace. The story evolves and continues to span two continents: When I began studying an M Phil (Management coaching) degree at the University of Stellenbosch Business School, South Africa in 2015, I presented a mini-workshop to Joe’s group of coaches at Stephenson Mansell Group in Sydney and discovered that evening that he knew Prof Anthony Grant from the University of Sydney’s Coaching Psychology Unit. This was an amazing co-incidence and Joe spontaneously offered to set up an appointment with Professor Grant, the person who coined the term ‘evidence-based coaching’. This was particularly relevant as I was battling with a Stellenbosch assignment on that aspect of coaching! I was so very grateful to both of them for the inspiration Prof Grant provided. Each trip to Australia, which took place roughly twice each year, I was delighted to meet with my 2014 Australian coaching pod at a lunch organised by Joe. Whenever we met, I was rewarded with new exciting opportunities offered to me. For example, my interest in Positive Psychology had been ignited and when the group mentioned a forthcoming Positive Psychology conference in Adelaide, South Australia, I was able to plan my next trip around attending that conference. Positive Psychology and my learnings from that conference helped a great deal with my research. In May 2017, following Joe’s instigation, I presented a workshop highlighting my M Phil findings to 40 coaches in Sydney for the ICF Australasia chapter, ‘The role of coaching in developing character strengths in leaders’. That workshop led to the June 2018 workshop, ‘The Productive Coach’ also held in the city center in Sydney. The ripple effect spread and that is how it came about that I’m presenting the webinar version: ‘How to be a more productive coach’ on Thursday, September 20th 2018. This new unique work is adapted from my new learnings at the African Doctoral Academy where I attended ‘The Productive PhD’ presented by Prof Sebastian Kernbach in January this year. I have taken some of the techniques which he presented as being helpful to PhD’s, expanded on them and adapted to coaching. Introducing these new, unique techniques into my own Executive Coaching and Leadership Development work over the last 6 months has achieved rewarding outcomes in my own developmental process and helped to achieve positive shifts for my clients. In the forthcoming webinar I’ll be sharing 3 of those techniques. That was a long story but shows the essence of my opening statement: ‘Through positive relationships others can spontaneously assist you in achieving goals you may not have dreamt of.’ I am very grateful, not only to Joe, but to the many people who have enriched my life in different ways. I do hope I have been able to be of benefit to them. Have you sincerely thanked those people who have recognised opportunities for you? If you look at the exciting things happening in your life right now, what is the ‘golden thread’ running through the networking you do? What gives you the courage to risk accepting new opportunities? How often do you provide opportunities for others that show that you believe in them? How might you have reciprocally impacted on the life of the person who helped you achieve your goals? How might your interaction in turn have created new opportunities, connections and inspirations for that person? For more information on the coaching and leadership development services offered by Brenda Eckstein International please contact me, Brenda on +27 82 4993311 or brenda@strategy-leadership.com Thank you! I am passionate about helping people to build positive relationships. Thus the concept of personal networking is built into many aspects of the services offered by Brenda Eckstein International (BEI). My first two published books on this topic, ‘Networking Tactics: A guide to achieving success through personal networking‘ (1st and 2nd editions) and ‘ABCs of Effective Networking: Fifty-two ways to achieve success‘ (1st edition) are in the process of being updated for the next editions which will join the ranks of my other books currently on Amazon. You might like to visit my Amazon author’s page. Over the years, I have included the improvement of networking skills and building of effective networks in the courses I have developed and currently run. These include the Networking Tactics, Communication Skills, and Enhance Your Executive Skills. Elements also come into all the leadership development and executive coaching programmes in my portfolio. Often a section of any course includes asking the participants to consider their individual one-year or three-year personal visions and then to identify the part that networking can play in helping them to achieve their individual visions. I then consolidate their lists of benefits and these often provide the framework for healthy group discussion around the topic. Below is a list developed as part of a recent 12-module Communication Skills course run for groups of mechanical and industrial engineers and other engineers in metallurgy or analytical chemistry. Their input has been consolidated, refined and expanded. Gaining new insights into your inner and external worlds. Enhancing every aspect of life. Interacting with others who may be experiencing issues similar to yours. Having access to like-minded people who can help alleviate loneliness. Acquiring and using networking skills which gives you confidence to communicate. Using communication skills more and thus improving ability to hold meaningful conversations. Having the confidence to accept invitations. Meeting a broad range of diverse people and expanding your network. Being exposed to different cultures, backgrounds and phenomena. Gaining greater understanding thus leading to new perspectives of justice or fairness. Building a feeling of connectedness, relatedness or safety with individuals. Understanding others better and thus knowing their wants and their needs. Recognising opportunities to reach out to people whom you may normally not communicate with. Accessing influential people and other individuals whom you may otherwise not meet. Being offered introductions to interest groups and incentives to join. Developing a sense of belonging to formal and informal groups. Building reputation and visibility thus enhancing our status. Having a safety-net for testing ideas. Being able to elicit trusted feedback from customers or others. Developing a broader pool of ideas for sustaining the ‘status quo’ or innovating. Helping to develop and set priorities. Effecting change in personal or business lives. Expanding knowledge applicable in your current position and exposure to opportunities for the future. Growth opportunities. Gaining different perspectives on solving problems. Boosting confidence in being able to accept challenges and achieve current or new goals. Recognising possibilities to expand beyond the current boundaries, either locally or globally. Increasing autonomy or control over events. Generating a greater sense of certainty because you are up-to-date. Saving time – knowing who to go to access information or to get the job done effectively. In which ways can you break your goal down into manageable chunks? What are the tactics you can put into place in order to help you achieve the goals? How can personal networking help you to achieve your goals? Which of the 31 benefits above could help you? In addition to the benefits listed above, what other benefits are there that may help you to achieve your goals? Who can assist you with improving your networking skills? What can you do to help others achieve their goals? For more information on the services offered by Brenda Eckstein International, please visit www.strategy-leadership.com Thank you! Happy networking! Many people on the treadmill of life are so busy taking step after step that they miss out on gaining from their current experiences or encounters along the way. So, as a coaching practice, I encourage clients to pause in purposeful and regular reflection. This increases awareness and enables people to benefit from what has happened in their lives. Sometimes it is good to trace back the threads which have added to the current tapestry of experience. We are looking for the ‘golden thread’ which has helped to change direction. Camilla Singh, project manager and Brenda Eckstein, author. Let me share an experience which happened to me today. At King Shaka airport in Durban, an unusual meeting place, I proudly presented the first copy of my new book, ‘GROW: how to turn your stumbling blocks into stepping stones’ to Camilla Singh who project manages and edits the publication of the books in the F-L-A-G-S series. The first two books are available in paperback (as seen in the photo) and as an e-book on Amazon. These two books contain a combination of personal stories and are written in a way that encourages the reader to reflect and create meaning from everyday experiences. Ideal for coaches, the books are also suitable for anyone who would enjoy reading motivational stories or others who are interested in self-development. At the end of each chapter are coaching questions which encourage reflection. That was a really good question. But I was concerned as I didn’t know how to go about this. As a website developer and listed as one of Australia’s main Mailchimp experts, he helped to link the dots showing me how to turn my stumbling blocks into stepping stones. It was easy. Following his framework my passion was converted into something tangible. My website became more functional and more colourful using a combination of colours that really appeal to me. With the help of a friend, Des, we created an image that was right for me and opened doors. With my son’s encouragement and support I was able to maximise the potential of the website and of my writings. I had the freedom to write an article whenever I found an everyday experience to be relevant to any of the five services offered by my business – professional speaking, facilitation of leadership development, training (mainly communication and networking skills), executive coaching and developing customer service strategy. Another brightly coloured thread that became woven into the tapestry was that of Candice Warr who remains the meticulous connector linking me, my writing, the website and relevant social media. Gary helped us with a structure that improved Google ratings and was simple to follow. As I wrote each article, Candice posted on my website and also linked to Facebook, Linked in, Twitter and Google+. We built up a Mailchimp mailing list by inviting people to subscribe to my newsletter on a complimentary basis. This was set up (again, by Gary, Australia’s Mailchimp expert) so that once a month a summary of the latest articles appeared in subscribers’ email boxes. This required minimal effort from the team. After three years of diligently following this process I had randomly written over 200 articles. We needed to use this valuable asset as part of a bigger picture. This is where my special friend, Camilla Singh, entered the scene and started weaving her magical threads to create a cohesive picture. She offered to project manage the production of a series of books based on my personal F-L-A-G-S philosophy, each letter forming a separate book. The F stood for Flow and the stories related to my work as a professional speaker. The L articles neatly fitted into the leadership development category, Lead. Continuous improvement strongly represented the training arm of the business and Advance became the title of that collection. G for Growth captured the essence of executive coaching, an area which has gained in importance. The last letter is S for Serve and emphasises the importance of having a strategic approach whether serving others in a business or personal capacity. The team under Camilla’s leadership has now published two of the five books on Amazon each in print and e-book versions. This would not have been possible without the dedication, commitment and expertise of Wendy Bothma who worked endless hours to make editing changes and format the manuscript. After publishing my original two books, ‘Networking Tactics’ and ‘ABCs of Networking’, I was clear that I did not wish to be the seller of books again. Thus Camilla investigated and advised that we go the Amazon route. This presented endless challenges for Camilla and for Wendy but they overcame these and turned the publishing stumbling blocks into stepping stones. Again, Des and Candice both played important roles. Des designed the covers and advised us on the aesthetic side of formatting. Candice remained immersed in the project, keeping meticulous lists of articles and original photos, and documenting which had been used. So, getting back to the beginning of this article, on reflection, getting ‘GROW: how to turn your stumbling blocks into stepping stones’ into a published book was not as difficult for any of us as finalising the first book. However, this would not have been possible without the excellent teamwork and friendships. Tracing the threads back, Gary’s formative influence in providing the framework, motivating me to take action and staying involved shows how important that ‘golden thread’ is. Which are some of the ‘golden threads’ in your life? What are some of the pivotal moments that enabled you to change direction? In which ways are you recognising and optimising opportunities? How can positive relationships help provide a springboard for future growth? Who are the people who have added colour to the tapestry of your life? In my second published book, ‘ABCs of Effective Networking’, I urge people to engage in quality conversation while travelling. Through recognising and optimising opportunities I have met some wonderful people. Of course, you need to be cognisant of people’s need for privacy and I do consider it a privilege if I sense that they are happy to engage in conversation. I was then able to lead the conversation towards our work-lives. When he mentioned that he is a professional speaker, the ‘penny dropped’. He was Travis Bell, the Bucket List Guy. He and I belonged to the same organisation of Professional Speakers in Australia. That is why he looked so familiar. Of course then the conversation flowed. As we chatted we discovered that there were so many people whom we both knew and we had attended the same conferences. When next you travel by air, make a conscious effort to build quality conversation with the person sitting next to you. Use the ‘Listen – comment – question’ technique. And ask open questions. Yet, respect the person’s privacy. Not only are you likely to have a far more interesting journey, you’ll discover the person sitting next to you and enrich your own life. How often do you connect with the person sitting next to you, whether it be during a journey or seated at a conference? What are you doing to improve your conversation skills? Once initiated, if the relationship is of value to you, what action can you take to sustain that relationship? It is exciting that Rob Salisbury and Monika Newman have again produced a compilation e-book covering contributions from leaders in the professional speaking industry who are based in many countries. Congratulations to both Rob and Monika on the excellence of their endeavours and for producing “Motivating Your Mind – Inspiring Your Spirit”. I’m delighted to have again been invited to write an article for this, their latest book. It shows the power of networking! I have known Rob for many years, in fact, since 2003 when I joined the National Speakers Association of Australia, now known as Professional Speakers Australia. Rob is one of the past presidents having held top leadership positions in the organisation. Through him I was introduced to Monika and we interacted at various conferences, conventions and chapter meetings in Australia. These encounters are interesting as I’m based in South Africa (but visit Australia as often as possible), Monika is based in Sydney, Australia and Rob in Singapore! What intrigues me, too, is how I have met and know so many of the contributers and their writing is a reflection of their professional speaking, training and coaching careers. So this book really is a consolidation of relationships built over time. Scroll down on the table of contents and click on Brenda Eckstein. Click on the download button in the top right hand corner of your screen or right click on the download button to either do a direct download or to save to your dropbox. Enjoy reading the rest of the book, too. Which articles are most relevant to the work you do? How can you use specific ideas in other areas of your life – for example in community work? Who are the writers whose work most appeals to you? In which ways could you follow Rob and Monika’s example – or connect with them? What could you to do to connect with the writers of these articles? How are you going to build relationships through reading these stories? The more we work at building a range of meaningful relationships, the more we’ll understand what others really need or how we can add value to their lives. We should be open to recognising and optimising opportunities to help others and we can do this through networking as it involves linking people with people, people with information and people with opportunities. Brenda Eckstein and Sizwe Mkhize – June 2016. In addition to the books and articles I have written on the topic of networking, training in networking or in relationship building is an exciting part of the work that I do. A networking module often forms part of longer courses, particularly in leadership development or communication skills. These are run for a wide range of different professions and businesses. For example, each year for the last sixteen years I have been privileged to be invited back to present a 12-session course in communication skills for engineering trainees. These young men and women, most in their early to mid-twenties include metallurgists, chemical engineers, maintenance engineers and others. And while their technical skills are good, this company, quoted on the Johannesburg Stock Exchange, finds that through these communication skills course, participants’ effectiveness has increased considerably through improving their ‘soft skills’. By the end of the course they are able to report more effectively to their supervisors and teams, get better results when instructing the artisans and generally conduct themselves more professionally. They become more valuable to the organisation. An added advantage is that their lives are more goal-orientated through building their personal strategy plans. These include tactics for consistently developing their networking skills while constructively developing their personal networks. During groupwork exercises, the participants discuss the benefits of networking as applied to themselves, their organisations, their industries and in the leadership roles to which they may aspire. How can building positive relationships improve our ‘way of being’ ? Being exposed to people with different points of view, our outlook may change. By taking us outside our comfort zone, we avoid complacency. Thus instead of being ‘stuck’ in our current ‘worldview’ which influences the way we respond or re-act to experiences, we become more ‘open’ to possibilities. This helps us to recognise and then optimise opportunities for ourselves and for others. Networking can help us to improve our communication skills in general. By holding quality conversations we learn more about others and by reflecting, more about ourselves. This helps in achieving our potential. Being in a better place also enables us to be more aware of our authentic ‘personal brands’ which we can now protect and we will thus more consistently show our true selves. Networking helps us to promote ourselves. We gain visibility and people may think of us when there are opportunities. For example, a new post may become available and we might be looking for that kind of work. People know us and our capabilities and may nominate us for leadership roles. The benefits are endless. By having role-models and mentors within our networks, we can more easily reach our goals, achieve higher standards of performance and in general, shift our ‘way of being’ which may benefit all areas of our lives in an Integral way. In which ways may becoming a better networker improve the way we operate? We learn new approaches through interacting with others. And from reflecting on what we see in others, it may help us to recognise our own strengths and consistently use them more. In addition, awareness of our strengths enables us to consciously use these strengths to leverage our weaknesses. Through building positive relationships and getting to know others, we’ll be more aware of how their strengths may be used to compensate for our weaknesses. The more we network, the more we are able to practise those skills that enable us to be better networkers. And the more competent we become, the greater our confidence and we are possibly able to venture forth and participate more fully in new networking areas that we wouldn’t have considered before. An example of opening new territory for ourselves would be that we are now more willing and relaxed when attending functions of cultural groups that are different to ours. Getting to know the culture and customs of others and be more comfortable in their company facilitates greater understanding, usually lowering prejudice and enables us to build healthier networks within a more culturally diverse and stronger framework. Networking can introduce more fun into our lives and this will reduce stress thus enabling us to perform better in all areas of our lives. In addition, we have a safety net when things go wrong! Our feelings of security are enhanced. What are the benefits when joining groups or working in teams? A sense of belonging is important to all of us. Here I’m referring not only to groups that we join or to which we are assigned but also to informal groups that evolve through our relationships. Often we may join groups or organisations for one reason, but friendship and support form the glue that binds us together and we may continue as members long after our original need has been met. An example of this is my membership of the New South Wales Chapter of Professional Speakers Australia. My work involves more coaching and training than it used to, and less professional speaking, but I feel like a member of that tribe and when we are together, I really feel that I belong. Thus I continue my membership and enjoy it even although, living in South Africa, I attend very few meetings and the reason for my joining twelve years ago is no longer a big part of my life. Building positive relationships helps us to feel that we are part of the group and this in turn means that we most likely will enjoy support when we need it. Having a strong support group can help us to achieve so much more not just because they motivate and encourage us, but also when we want to try new things. An illustration of this was that, recently when preparing a new talk for specialist doctors, I first invited a group of my friends and business associates to a ‘practice run’. I knew they would give me constructive feedback, which they did and this was very much appreciated. I would not have been able to do this with a group of strangers and may not have trusted their feedback. In general, networking can give us constructive advice from experienced people. Within our organisational or work teams, stronger bonds facilitate more efficient teamwork. The task gets done better, the team is happier and the needs of individuals are more likely to be met. And this makes it easier for the leader to work from a position of strength, especially in these VUCA (volatile, uncertain, complex and ambiguous) times like this where collaborative leadership works well. Leaders can discover new talent and use the diverse strengths of individuals within the team more effectively. Networking can help to enhance a leader’s performance in so many ways. How does networking have a positive influence on systems? Networking helps to provide access to general and exclusive information through sharing. We know who to approach for the right advice. In addition, if we know the ‘right’ people, we are far more likely to be told about vacancies, given appointments, introduced to previously inaccessible people, and know how the organisation works. There is always a great deal of ‘tacit knowledge’, that which is not articulated. And by speaking to insiders we learn ‘how things work around here’, what really happens and what is important to those who belong. Others can help us to unearth the implicit and make it explicit. Thus networking helps newcomers to be absorbed into systems and be assimilated into cultures. I was inspired to write this article through the input of the young engineers. I’m grateful to them. The above are just some of the benefits of networking as consolidated from the benefits which they identified and I have added considerably to their contribution. In which ways can networking help you to shift your ‘way of being’? What should you be doing right now to improve your networking skills? Who should be included while you build a stronger network? How can you harness the power of collective networking? Building relationships enables us to explore possibilities and then work together for mutual advantage. The benefits are enormous. Through my membership of the NSAA (National Speakers Association of Australia) I met Rob Salisbury, Director of Strategic Resources International who is based in Singapore, Sydney and the USA. And it was through the same organisation and through Rob that I was introduced to Monika Newman of Absolutely Virtual, who is based in Sydney. I am delighted to have again been invited to be a contributing author to their excellent e-book ‘Motivating your Mind … Inspiring your Spirit’. 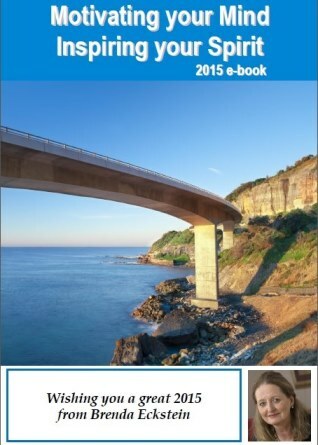 Congratulations to Rob and Monika on initiating, co-ordinating and completing yet another excellent e-book. This 2015 edition contains 107 stories written by over 95 contributors. And they are based in many different countries. Select save page to Dropbox or save to your computer. You’ll have your own copy of ‘Motivating your Mind…Inspiring your Spirit’ which you are welcome to share with others. My two articles, ‘Broken Biscuits’ and ‘Don’t worry, be happy’ appear on pages 35 and 36. Enjoy reading the stories. And as you read them, think of the power of networking, building relationships. Without my Australian friendships I would not have been invited to contribute stories to this book – and I would therefore not have shared them with you! Thank you for being part of my network. For more information on training in networking skills please see www.strategy-leadership.com or contact Brenda on brenda@ strategy-leadership.com or +27 82 4993311.